As a passionate supporter of the slow food movement there’s nothing I love more than learning about artisan food and the traditional techniques used to make it. So, when the guys at Salt House offered to take me on a tour of their favourite salts I jumped at the chance. All salt has ultimately come from the sea: rock salt is thousands of year old seawater which has been dried and trapped underground. Seawater itself is different all over the world – it even varies as you go down in depth; so as you can see how the properties of salts are dependent upon where the sea water is taken. Location is not the only variable, however. How the salt is extracted also has implications for its character. Sea water can contain in excess of 90 different elements, so the exact point at which the extraction process starts and stops, retaining or removing different elements, is critical. The industrially processed salt we are all too familiar with, not least in our chippies and fast food outlets, has been scientifically cleared of all minerals and elements to leave 99.99% sodium chloride; this is also broadly the case with readily available processed sea salt. The procedure strips all other elements out as they can be used separately and sold on more profitably. The first salt we recommend trying is Saltverk. This is a clear, glistening crystal which almost looks like ice, hinting at its origin. Sea water is taken from the north Arctic oceanic stream as it flows past a small peninsular in northern Iceland. The water is then evaporated using the heat from geysers. This leaves a clean, crisp tasting salt that has a light crunch and works brilliantly for a tasty tomato salad and will bring out the phenomenal flavour of smoked lamb. The Fleur de Sel (Flower of Salt) traditionally comes from Brittany and one of our favourites has to be Brittany’s Fleur de Sel de Guerande. Salt has been produced there since at least the 4th century, but it was in the 6th or 7th century that they developed the process still used today. They draw the sea water into a single pond and then move it on when it has reached a heightened salinity. It is moved on again when it is a stronger brine and again until it reaches the final settling pond where crystals start to form. These precious crystals are then diligently hand harvested in time-honoured fashion. This salt gives a sensationally smooth taste that leaves a lovely lingering mouth-watering flavour. Just crumbling this onto a green salad will lift it to gourmet levels and any butter made with this salt alone is worth travelling for. Now, to move on to a bolder, more eccentric and perhaps exciting salt: Agnui no Shio from one of the most southerly islands of Japan in the East China Sea. The Japanese have just started producing sea salt as in 1975 it was banned and everyone had to use the industrially processed salt with its alien implant, iodine. However, in 2002 the doors were opened for a passionate revival in sea salt made in traditional ways. The Japanese have to be resourceful as they have a high humidity which has necessarily impacted their unique production methods: sea water is pumped up a tower then gently trickled down bamboo. This encourages the water to disperse into small droplets, thereby increasing the surface area exposed to air and, in turn, increasing the amount of water that is evaporated. Once the brine has reached a specific concentration, it is boiled up to produce the final product. This salt gives a bold burst that dissipates very quickly leaving the mellow flavours of your food on your taste buds. Agnui no Shoi works particularly well with fish and rice, leaving fantastic aromatic flavours to dwell around the mouth. Himalayan Rock Salt is probably one of the most celebrated of all the specialist salts: carved out of a mountain side in Northern Pakistan, it too, was originally sea water. Subsequently there is little or no pollution affecting it and it prides itself as being one of the freshest available. It is often marketed, although not so much in the UK, as being a health food or a purifying tonic due to the abundance of elements, its origin and wonderful pink colour. Its uses are boundless as it comes in all shapes and sizes such as an amazing block which you can cook on, and also a shot glass or a pestle and mortar which incorporates some salt as you pound. This salt encourages a particular sweetness onto the tongue whilst allowing the true flavours to flood through. In this form, its versatility is similarly broad – we would recommend for sumptuously curing venison from the highlands or adding a certain panache and depth to a curry. This leaves us with a couple of “flavoured” salts. 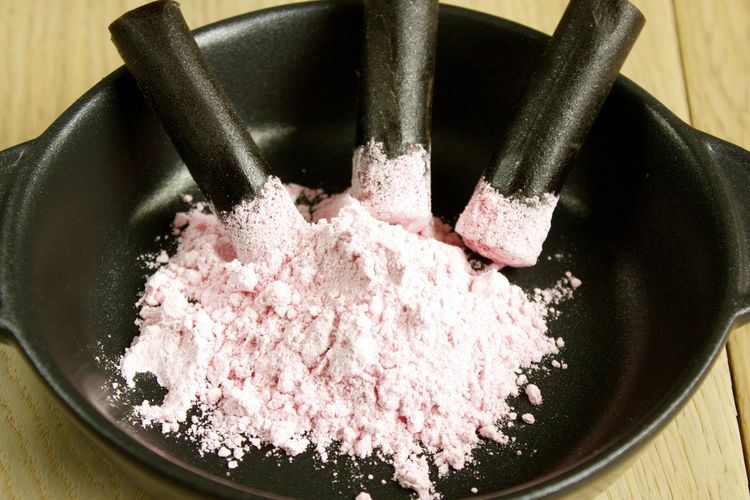 The “diva” of salts is Hawaiian Hot Black Lava: not for the faint-hearted, this is a traditional Hawaiian sea salt which has been infused with activated carbon. The flavour works on many punchy levels and the carbon serves to not only enhance the intestinal benefits of the salt, but also challenges the whole concept of “salt” for the consumer by the contrast in expectant colour. This is THE salt to put on pineapple! As you eat the salted pineapple, an elevated sweetness comes rushing in and, magically the often bitter and astringent note of pineapple, is oppressed then there is the final crunch down on the crystals giving a gratifying contrast of soft and hard, tantalisingly leaving you with a light, poignant, tingle from the chilli: WOW, you will never eat pineapple alone again! Think of Sicily, the largest island in the Mediterranean where the sun beats down and the dry African winds blow past: it is ideal for producing Ravida Fennel Pollen Sea Salt. This is from the West Coast of Sicily where they have been harvesting salt for centuries. It also plays host to abundant crops of fennel. Local producers take advantage of a unique opportunity to marry the two and the strongest part of the fennel plant, the pollen is combined with freshly garnered salt crystals. The result is simple and effective: throw this onto the top of sole and put in the oven, when brought out, the aromatic fennel will cause delighted squeals and force you to pick at the fish with renewed ardour. Each salt offers a range of trace elements which affect the flavours and dynamics of your food. The secret is to use the right salt at the right time – reducing the amount required, while ensuring that the body’s salt needs are met. Great salts are not purely sodium chloride – they bring an intriguing mix of minerals including magnesium, potassium, calcium, iron and many more besides. Get your taste buds working and enjoy. Many thanks to all at the Salt House for their insight and the chance to try their delicious products. Courgettes are at their best this month and offer a range of possibilities to the adventurous cook - from delicate flowers stuffed and coated in crisp tempura to grated courgette in a delicious chocolate cake. Alternatively, you might prefer to exploit their flavour carrying qualities by marinating in flavoured oil and shaving ribbons into a dressed salad. In countries such as Canada, Australia, the USA and Germany, the plant is called a zucchini - from the Italian “zucchina" (small pumpkin). According to the Guinness Book of Records, the world’s largest courgette was almost 6 foot long and weighed 65 lbs. There are more than 100 varieties of courgette, each with different markings - including the "Sunbeam" with bright yellow and white stripes! In a 2005 Dolmio poll, the courgette was voted Britain’s 10th favourite vegetable. Courgettes do have a high water content, which makes them low in calories, but they are also a good source of folates, vitamin C and vitamin A - helping to prevent both cancer and heart disease. A single courgette also contains more potassium than a banana. When shopping, look for courgettes that are small (water content increases as they grow bigger diluting their flavour), heavy for their size with shiny unblemished skin. Seasonal recipe: try this simple courgette and citrus salad with pan fried cod. Tarocco: grown in the nutrient-rich soil around Mount Etna, Tarocco are sweet in flavour and have the highest vitamin C content of any Orange variety in the world. Moro: from Siracusa in Sicily have the deepest colour, sometimes almost black, making them great for providing visual contrast to dishes. Sanguinello: the Spanish Sanguinello is more sweet than the Moro and more deeply coloured than the Tarocco, so is a good all rounder for a variety of uses. Whichever type you prefer, blood oranges can be used in sweet or savoury dishes as the flavouring for souffles, an accompaniment to seafood, part of a winter salad, a refreshing sorbet or, of course, a delicious cocktail. To get going, try this easy blood orange and lemon posset. Clementines, in season from late October until early January, are the result of accidental cross fertilisation, with the first fruit "discovered" in the garden of an Algerian orphanage. Less acidic than oranges, they are usually sold seedless - achieved by keeping them unfertilised. American growers thought this so important that they once threatened to sue local bee keepers for fear of accidentally pollinating their crops. Early celebrity chefs, such as Marie Antoine Carême, liked to fill them with stripes of jelly and blancmange, leaving unsuspecting guests amazed as they cut "ordinary" fruit to reveal exotic surprises within. In the morning, in the soft sultry chamber, sit in the window peeling tangerines, three or four. Peel them gently; do not bruise them...separate each plump little pregnant crescent...Take yesterday's paper (when we were in Strasbourg L'Ami du Peuple was the best, because when it got hot the ink stayed on it) and spread it on the radiator...After you have put the pieces of tangerine on the paper on the hot radiator, it is best to forget about them...On the radiator the sections of tangerines have grown even plumper, hot and full. You carry them to the window, pull it open, and leave them for a few minutes on the packed snow on the sill. They are ready...I cannot tell you why they are so magical. Perhaps it is that little shell, thin as one layer of enamel on a Chinese bowl, that crackles so tinily, so ultimately under your teeth. Or the rush of cold pulp just after it. Or the perfume. I cannot tell. This simple approach never fails to amaze, and works equally well with satsumas, clementines or tangerines. Alternatively, if you are feeling more adventurous, why not try these delicious Clementine, pomegranate & panna cotta jellies. I was at a fantastic wedding recently and the happy couple handed out favours to the guests containing small bags of sweets from the 1970's - think flying saucers, black jacks and refreshers - leading to drunken reminiscences of childhood confectionery. Sherbet fountains were my particular favourite, partly because they looked like sticks of dynamite, but also because they were two sweets in one. Recreating them isn't exactly haute cuisine, although the Fat Duck (once voted best restaurant in the world) does give all of its guests a retro sweetie bag to take home, so I thought I’d give it a go. Just take 100g of icing sugar, 2 level teaspoons each of the bicarb and the citric acid and 15g of whichever dehydrated fruit you prefer (raspberry or strawberry would be my choice - just look in the baking section of your local supermarket). Blitz in a spice grinder and you are done. You can play with this basic recipe depending whether you like a sweeter, fizzier, more sour or more flavoursome result. If you want to go the whole hog you can also make the liquorice, although I just bought a bag from the local health food shop to make this a 10 second recipe. Just one word of caution though, most online advice is that citric acid can be bought in pharmacies. When I asked my local pharmacist I was told that it is used by drug dealers to “cut” their wares, so UK chemists have been instructed to stop selling it… however, I did find it in the spice section at my local Asian supermarket. See strawberry and passion fruit sherbet recipe.